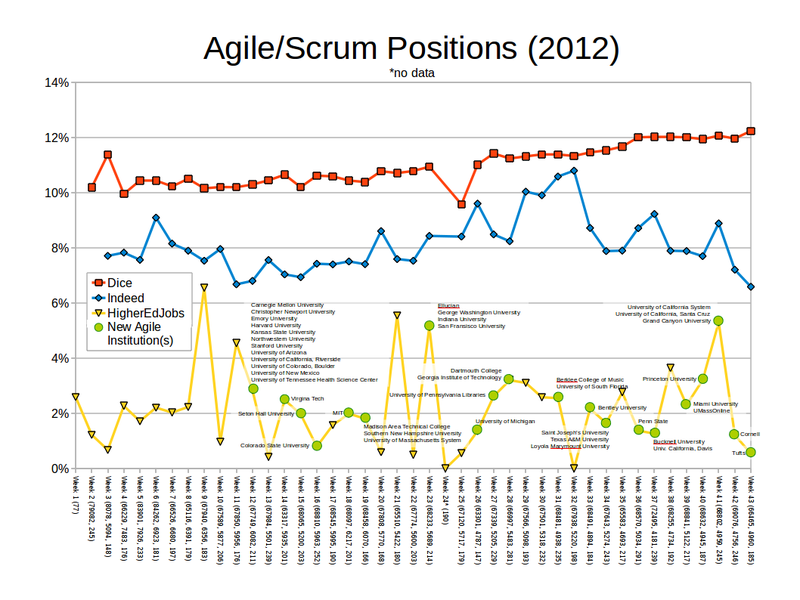 Beginning in April, 2012, I began listing the names of the colleges and universities returned by Higher Ed Jobs matching the Agile/Scrum search parameters (see Methodology below). The following colleges and universities have advertised open IT positions in HigherEdJobs.com referencing Agile and/or Scrum. Each job posting contributing to the college or university inclusion in this list was reviewed to ensure the position included an interest in Agile or Scrum related methods, as opposed to simply using the word “agile” in the job position (e.g., “The University seeks an agile individual…”). Below this list are organizations that service the Higher Ed community. Search Criteria Admin-Computing; Database Administration; Management/Director; Multimedia; Network/System Administration; Programming/Analyst; Support and Training; Web Development, and; Other. You are currently reading Agile Adoption in Higher Ed IT (one measure) at TwoThree98.